This model, last updated on January 2, 2019, [note: no update since then due to government data delay] currently shows a .8% probability using data through October. The two models featured above can be compared against measures seen in recent posts. 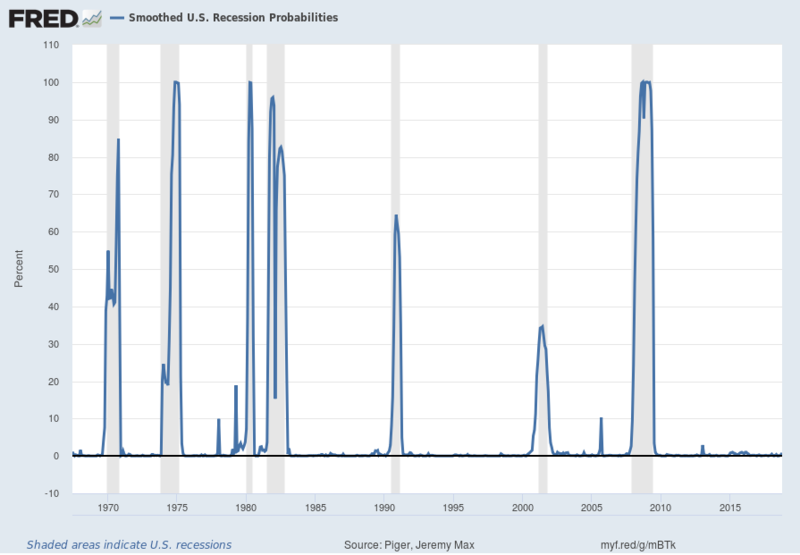 For instance, as seen in the January 10, 2019 post titled “The January 2019 Wall Street Journal Economic Forecast Survey“ economists surveyed averaged a 24.80% probability of a U.S. recession within the next 12 months. This entry was posted in Economic Forecasts and tagged economic indicators on February 6, 2019 by Ted Kavadas.